Metatarsal fractures represent a common fracture type accounting for 35% of all fractures within the foot and 5% of total skeletal fractures annually. Central metatarsal fractures are caused by excess torsional force applied to the bone or direct trauma, with most fractures being attributed to the latter. As with most fractures, minimally displaced fractures of the central metatarsals are amenable to conservative treatment including protected immobilization and RICE therapy. 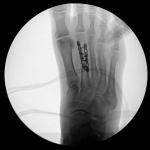 In general, physicians may be accepting of subtle displacement of central metatarsal fractures accepting up to 10 degrees of displacement and 3mm of translation in any direction. 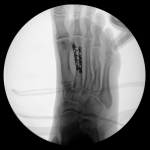 When displacement is too great, metatarsal fractures are treated with closed reduction with percutaneous pin fixation or ORIF with pin or single plate fixation. 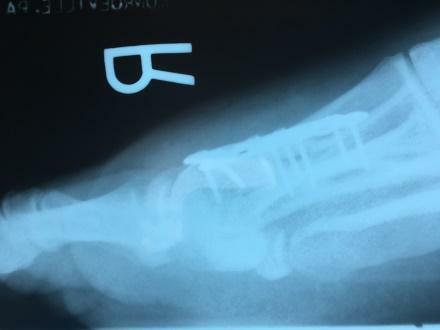 This case report presents a case of a gentleman who suffered from a comminuted metatarsal with a unique fracture pattern that required dual plating technique for proper reduction of the fracture. 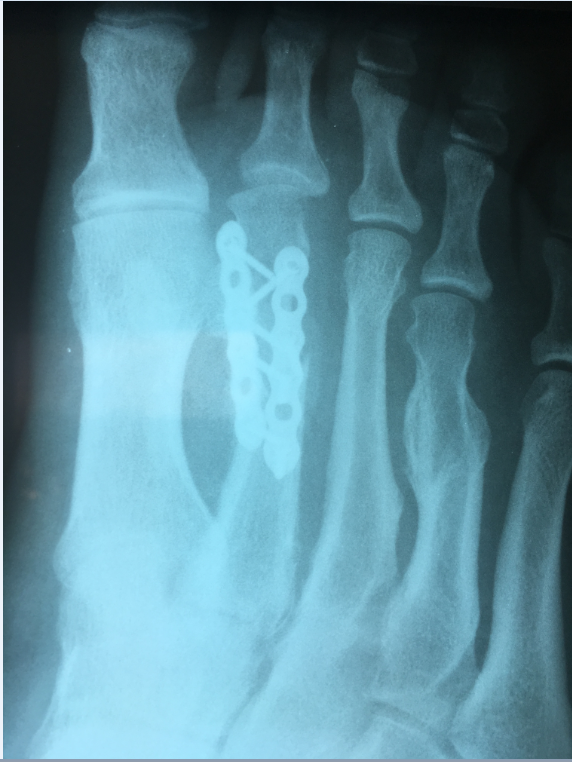 With this unique fracture type, dual plate technique optimized fixation in order to stabilize an unstable fracture of a second metatarsal in an obese patient with diabetes. Metatarsal fractures represent a common fracture type accounting for 35% of all fractures within the foot and 5% of total skeletal fractures annually . These fractures can be isolated injuries, simultaneous fractures with other metatarsals and foot fractures with ligamentous Lisfranc injuries. They can also be either traumatic or caused by prolonged stress across the bone. Most metatarsal fractures are generally a result of low energy trauma, however high energy crush injuries may occur . Metatarsal fractures occur in multiple locations and are generally divided by location into proximal metaphyseal, diaphyseal/shaft, and head/neck fractures. Proximal fractures are generally associated with Lisfranc injuries. Proximal metatarsal fractures generally remain stable and well aligned secondary to the multiple ligamentous and tendinous structures which stabilize the metatarsals [2-4]. Diaphyseal fractures are generally oblique in nature, but can present in many fracture patterns. These fractures are less stable and should be evaluated for shortening and displacement . 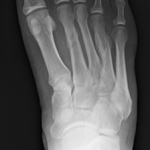 The diaphyseal region is the most common site for stress fractures of metatarsals, especially the central metatarsals. 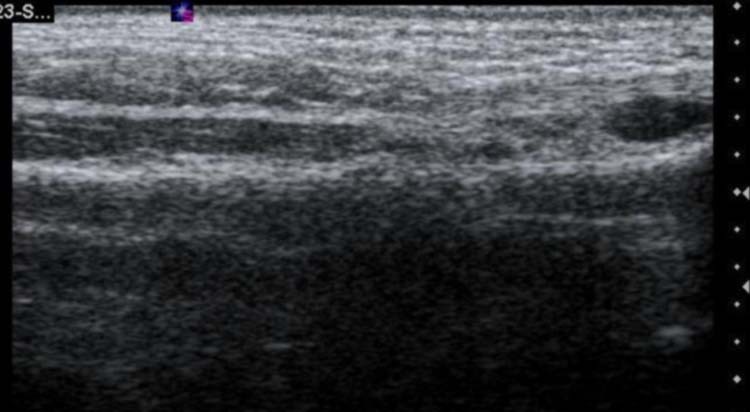 Stress fractures, if untreated, can progress to complete transverse or oblique fractures. If displacement is present with diaphyseal fractures, it typically occurs plantarly and laterally . Central metatarsal fractures occur considerably more than first metatarsal fractures. These fractures can affect more than one metatarsal as metatarsal 2-4 generally act as a unit. The literature states that 63% of third metatarsal fractures occur with either a second or fourth metatarsal fracture or 28% with both. Therefore, extensive evaluation of radiographs and possibly the use of other imaging modalities should be used if an isolated metatarsal fracture is identified in metatarsals 2-4 . Central metatarsal fractures are caused by excess torsional force applied to the bone or direct trauma, with most fractures being attributed to the latter [1,2]. Direct trauma includes crush injuries or penetrating injuries to the foot. 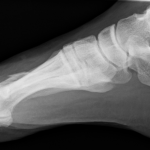 Spiral or oblique fractures are produced by a twisting injury over a fixed forefoot. Secondary to central metatarsal lack of motion, soft tissue attachments, and stable articulations, these fractures are intrinsically stable. However, when displacement occurs, the central metatarsals are more likely to displace as a unit [1,2]. As with most fractures, minimally displaced fractures of the central metatarsals are amenable to conservative treatment including protected immobilization and RICE therapy. In general, physicians may be accepting of subtle displacement of central metatarsal fractures accepting up to 10 degrees of displacement and 3mm of translation in any direction [6-9]. Plantar displacement is often tolerated the least out of all planes of deformity secondary to excessive plantar pressures. Dorsally displaced fractures can cause excessive strain on adjacent metatarsals leading to transfer plantar lesions and possible adjacent stress fractures. Frontal and transverse plane deformity, generally are well tolerated. However, it has been shown that displacement in the frontal or transverse plane may cause nerve irritation in the metatarsal interspaces, as well as, digital deformity over time [6-9]. The goal of central metatarsal fractures is to achieve anatomic alignment of the metatarsal using stable fixation. This goal can be achieved using both open and closed techniques. In patients with significant comorbidities or vascular compromise achieving extra stable reduction utilizing minimally invasive techniques is idea . Percutaneous Kirschner (K-wire) wire pinning can be performed with a variety of techniques for adequate fixation. The most common method includes intramedullary fixation across the fracture site with use of a large diameter k-wire. 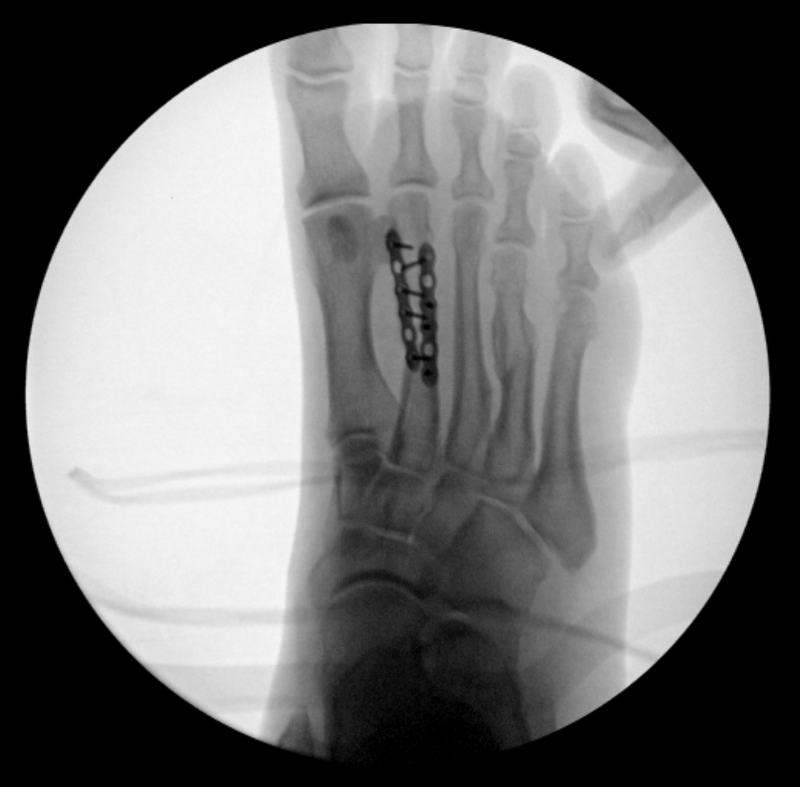 Crossing multiple k-wires may also be an acceptable technique for fixating metatarsal fractures . Advantages of k-wire fixation include the ability to maintain vascularity to the fractured bone with minimal dissection and soft tissue disruption. The main disadvantage is the inability for direct visualization and manipulation of the fracture . 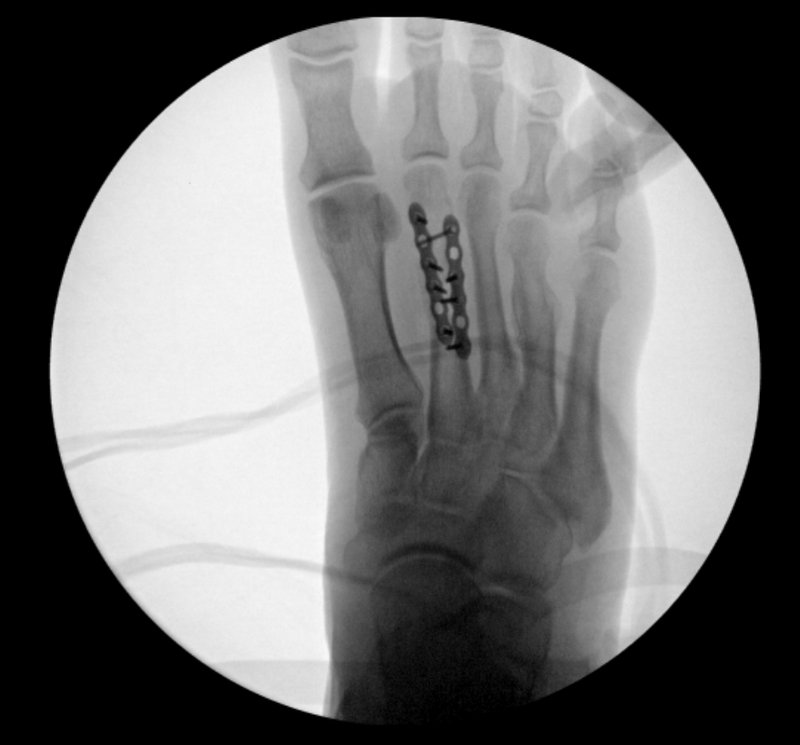 Open reduction internal fixation (ORIF) is also a viable option for treatment of metatarsal fractures, especially if the fracture is significantly displaced or comminution is present. ORIF technique has the advantage of being able to visualize the fracture site in order to achieve complete anatomic reduction with application of more stable fixation . 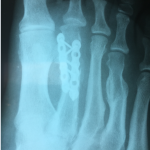 In terms of fixation, screw fixation is possible for oblique type fractures, however, use of screws for central metatarsal fractures may be challenging. 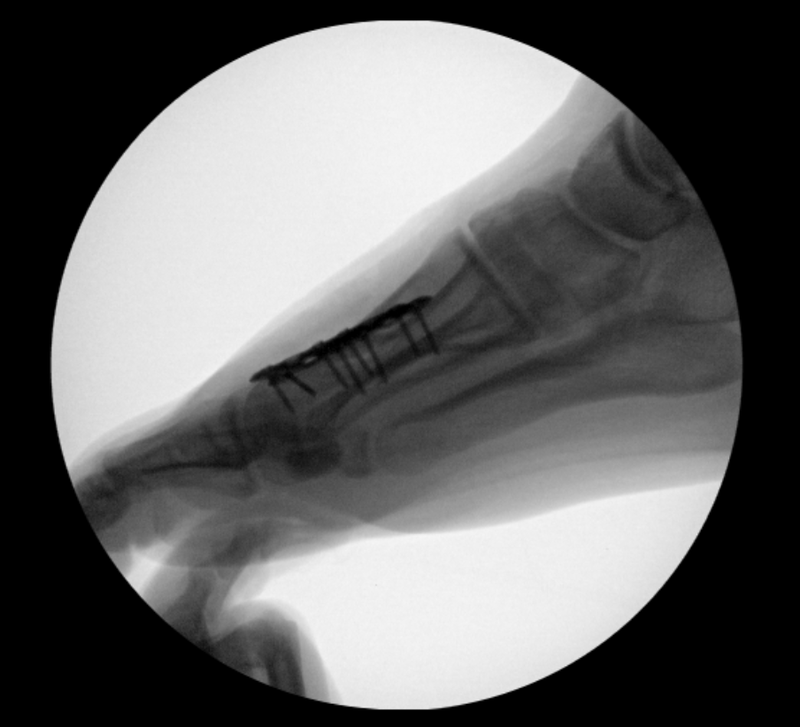 If ORIF technique is used, fixation generally consists of either k-wire fixation, or the use of dorsal plate fixation using mini or small fragment plates and screws. Locking plates may also be beneficial in patients with significant comorbidities or poor bone stock . Complications are relatively uncommon with either technique. Common complications with fixation of central metatarsal fractures include delayed or non-union, malunion, metatarsalgia, or digital deformity. 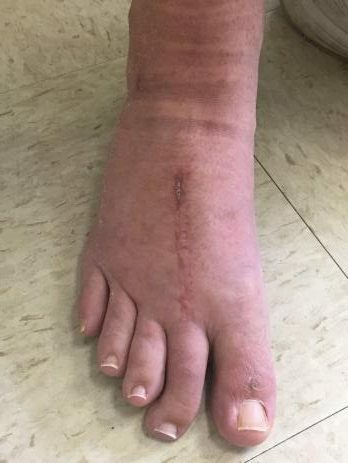 In general delayed union or malunion complications are secondary to poor blood supply due to dissection techniques or comorbidities, or excess stress secondary to chronic stress fracture and foot deformity . Biomechanical studies have shown that biplane fixation has increased stiffness as well as a decrease chance of hardware failure resulting in a more stable construct. Dayton et al in their biomechanical study showed that biplane plating showed to have superior or equivalent stability in multiplanar orientations as compared to a single plate with interfragmentary screw. However, dual plating is not without its drawbacks; Increased soft tissue dissection, periosteal stripping, theoretical increased operating room time, increased chance of hardware irritation, and increased cost are several disadvantages to dual plating . There have been numerous studies that reference orthogonal/dual plating throughout the body for fracture reduction and stabilization [11-23]. However; there have been no studies for dual plating lesser metatarsals for acute fractures. 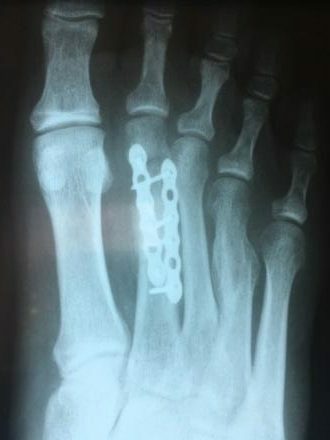 The purpose of this case study was to provide a scenario where the application of dual plating technique to an unstable lesser metatarsal fracture was warranted. A 52-year-old male presented with acute tenderness to the 2nd metatarsal of the right foot. The pain began approximately one week prior to presenting to us. He denied any injury to his recollection. 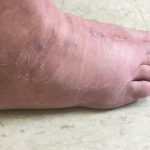 He initially thought it was a gout flare up secondary to his history of gout flare ups and was prescribed a Medrol dose pack by his PCP which provided no relief. 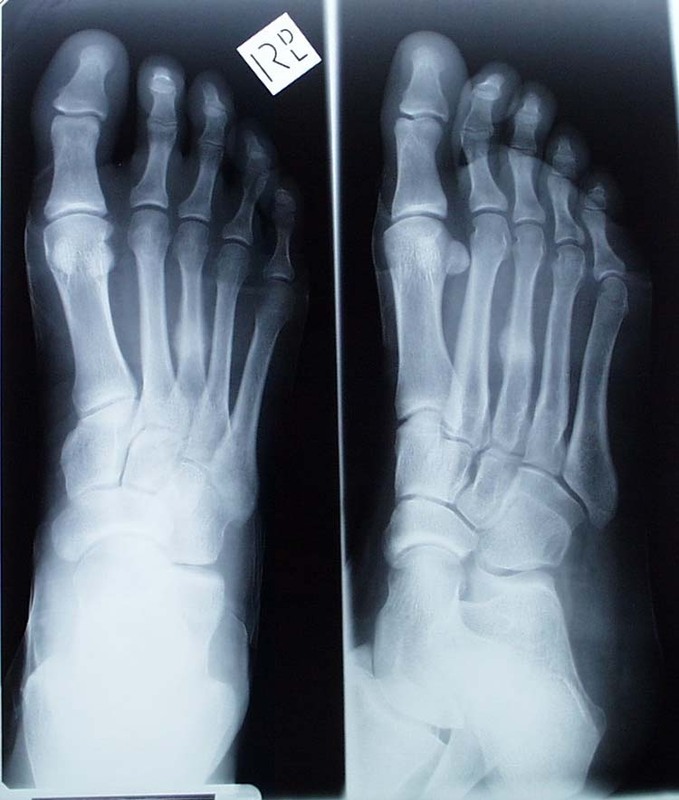 Therefore, the patient went to the emergency room in which radiographs were taken which demonstrated the patient had a displaced mid-diaphyseal fracture to the second metatarsal of the right foot (Figure 1). The patient also stated that within the last week he had also noticed lateral deviation of his second digit which was progressive. This was confirmed via physical exam as a flexible deformity secondary to displacement of the metatarsal fracture site. Physical exam revealed acute swelling and warmth about the midfoot and forefoot of the right foot focused about the second metatarsal. No ecchymosis was present. There was also point tenderness to the second metatarsal with reducible lateral deviation of the second digit at the level of the second metatarsophalangeal joint (MTPJ). 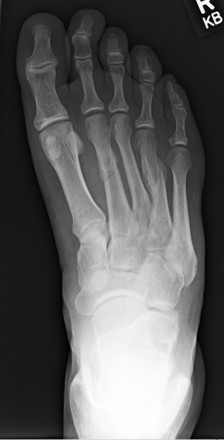 With the radiographic displacement present and the patient’s medical history including diabetes, obesity, gout and other associated medical ailments it was decided the best course of action for the patient was to schedule the patient for ORIF of the second metatarsal with capsulotomy and extensor tendon lengthening to the second digit all right foot. Until the surgery the patient was placed in a Jones compression dressing and placed in a CAM walking boot. Figure 1 Pre-operative radiographs AP, oblique, lateral. 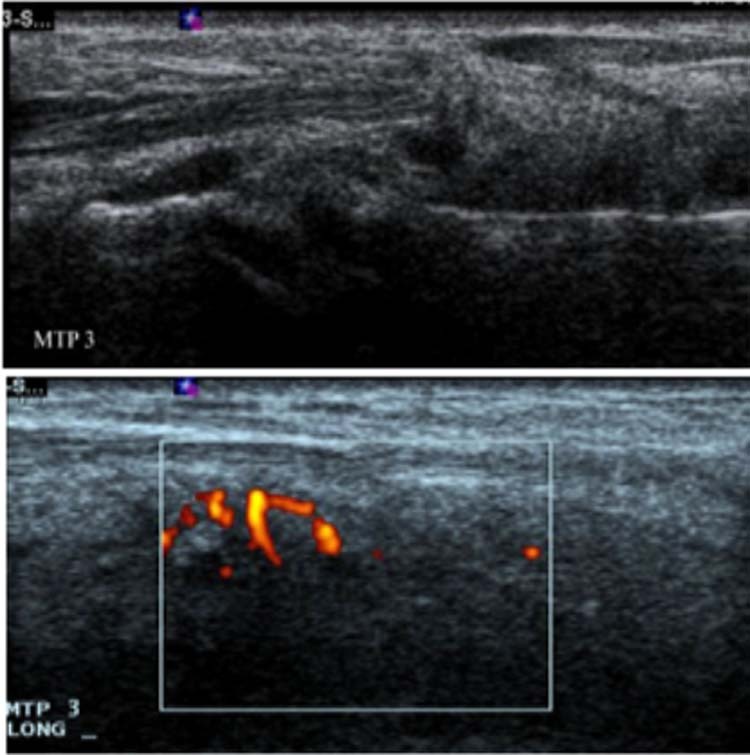 One week after initial presentation, the patient underwent ORIF of the second metatarsal with capsulotomy and extensor tendon lengthening of the second MTPJ of the right foot. Incision placement was made on the dorsal aspect of the second metatarsal beginning at level of the proximal third of the metatarsal extending distally past the second MTPJ. Dissection was carried down to the level of the extensor tendons in which a Z-tenotomy of the extensor digitorum longus tendon, as well as, a complete tenotomy of the extensor digitorum brevis tendon was performed. At this time, attention was focused to the fracture site. Using standard techniques all bone callus was debrided and the fracture was reduced by joystick technique utilizing a 0.062 K-wire in the capital fragment in order reduce the fracture and pull the metatarsal out to length. Once adequate reduction was achieved, the fracture sites were fixated provisionally with 0.045 K-wires. With further evaluation and thought, it was determined that two plate fixation would be optimal fixation with the current fracture pattern. This was achieved utilizing two 6-hole mini-fragment locking plates oriented obliquely into the bone and staggered for proper locking screw placement (Figure 2). With the two plate construct, both medial and lateral dorsal fragments were fixated to the constant plantar fragment achieving stable fixation. Figure 2 Intraoperative radiographs AP, oblique, lateral. After fixating the fracture site, soft tissue balancing for the lateral deviation of the second digit was performed. With reduction of the fracture, the digit deviation had decreased dramatically. The remaining deformity was addressed by performing a lateral capsulotomy at the level of the MTPJ and repairing the extensor longus tendon in an elongated state providing no tension to the digit at the level of the second MTPJ. 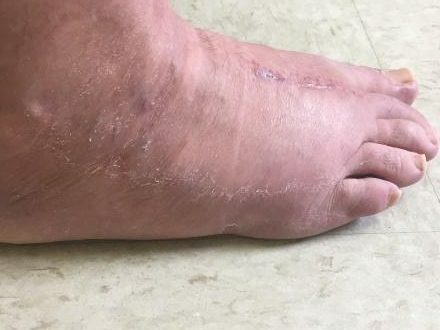 Post-operatively the patient remained non-weight bearing in a CAM walking boot for 4 weeks. After 4 weeks, the patient began to progressively bear weight on his right foot in a CAM boot only. After 2 weeks of weight bearing in a CAM boot the patient was transitioned into a tennis shoe comfortably. At that time, serial radiographs were obtained showing adequate consolidation of the fracture site with maintained reduction and position (Figure 3). The patient was able to return to work in full capacity at 8 weeks with no restrictions. 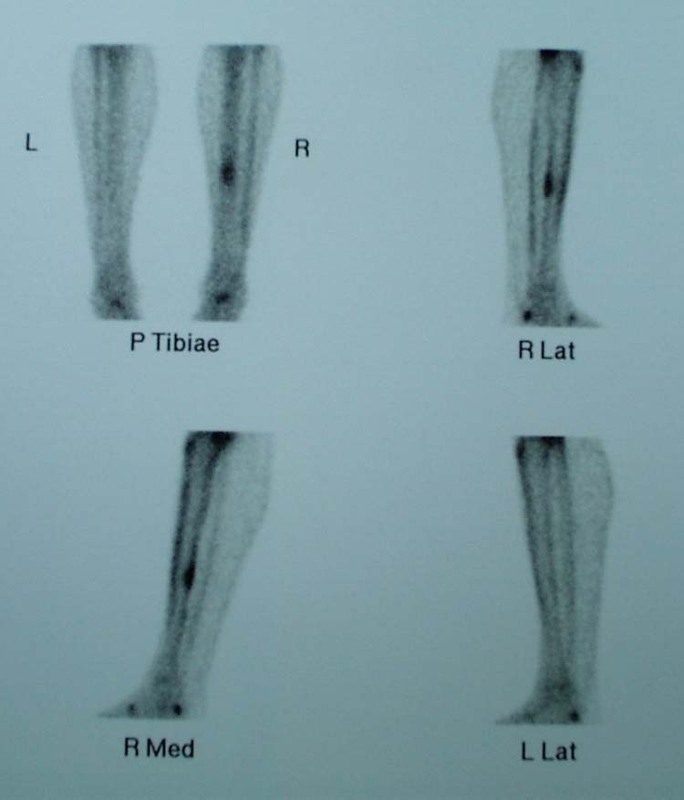 Figure 3 Post-op clinical pictures and radiographs AP, oblique and lateral. Comminuted fractures of any long bone can be challenging to treat surgically. Though there are many techniques which have been shown to be viable options for such fracture types, dual plating has been shown to provide adequate stability and maintain correction of complex fractures of long bones. As stated, Dayton et al were able to show that a dual locking plate technique with single cortex locking screws, when compared to single locking plate with interfragmentary screw fixation, showed superior or equivalent stability in multiplanar orientations of force application in both static and fatigue testing. Though this study was used primarily to show stability at fusion sites such as the first tarsometatarsal joint, the results are very applicable to complex fractures of long bones . Dual plating has also been documented as a viable option for fracture fixation within the literature. There have been many studies within orthopedic literature showing the successful use of dual plating technique for fracture ORIF of fractures not within the foot and ankle [18-23]. However, there is also extensive literature is the use of dual plating for complex ankle fractures [12-17]. Kwaadu et al. evaluated the use of dual plate technique for the repair of complex fibular fractures on 25 patients. 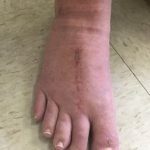 All 25 patients underwent benign postoperative courses with eight patients having complications all of which were wound complications. No additional operations were performed as a result of this technique. No patient undergoing this technique complained of any hardware irritation, and no hardware removal was required. The average time to radiological healing confirmed via radiograph was 7.5 weeks . Vance et al. reviewed 12 consecutive patients who underwent ORIF of fibular fractures utilizing two 1/3 tubular plates for fixation. All fractures healed both clinically and radiographically. Only one patient required hardware removal. FAOS scores were obtained at a mean of 25.6 months after surgery and showed results of pain (87.6, SD = 9.5), activities of daily living (90.4, SD = 14.5), symptoms (93.3, SD = 9.5), sports (89.5, SD = 18.1), and quality of life (57.4, SD = 21.3) . 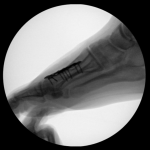 Our case report demonstrated successful use of dual plating technique for ORIF of a comminuted metatarsal fracture. It is our belief that this technique provides added support which was needed secondary to the fracture pattern presented. Dual plating is warranted in cases when traditional fixation techniques (i.e. K-wire fixation, screw, single plate) will not allow for appropriate reduction or stabilization of the fracture segment. This fixation technique can be another tool in the surgeon’s armamentarium. 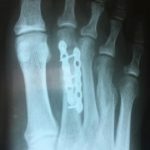 While this case study was not the first to incorporate dual plating in fracture cases, it is the first to document dual plate technique for lesser metatarsal fractures. Buddecke D, Polk M, Barp E. Metatarsal fractures. Clin Podiatr Med Surg. 2010 Oct;27(4):601-24. Petrisor B, Ekrol I, Court-Brown C. The epidemiology of metatarsal fractures. Foot Ankle Int 2006;27:172–5. Maskill J, Bohay D, Anderson J. First ray injuries. 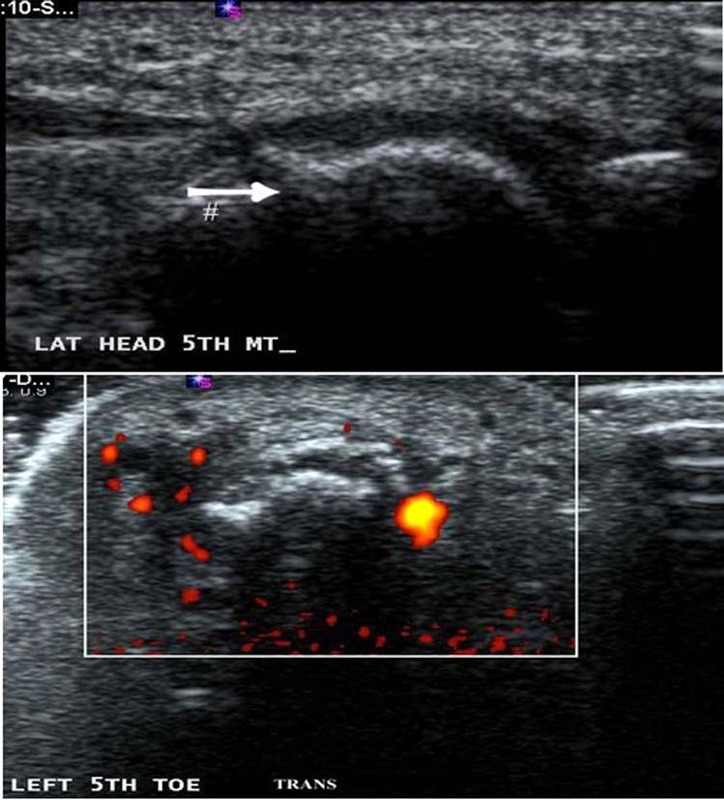 Foot Ankle Clin N Am 2006;11: 143–63. Pearson J. Fractures of the base of the metatarsals. BMJ 1962;1:1052–4. Maxwell J. 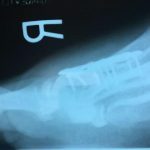 Open or closed treatment of metatarsal fractures: indications and techniques. J Am Podiatry Assoc 1983;73:100–6. Hansen ST. Foot injuries. In: Browner BD, Jupiter JB, Levine AM, et al, editors. Skeletal trauma. Philadelphia: WB Saunders Company; 1998. p. 2405–38. Early J. Metatarsal fractures. In: Bucholz R, Heckman J, Rockwood C, et al, editors. Rockwood and green’s fractures in adults. Lippincott, Williams, & Wilkins; 2001. p. 2215. Shereff M. Complex fractures of the metatarsals. Orthopedics 1990;13(8):875–82. Armagan O, Shereff M. Injuries to the toes and metatarsals. Orthop Clin North Am 2001;32(1):1–10. Donahue M, Manoli A. Technical tip: transverse percutaneous pinning of metatarsal neck fractures. Foot Ankle Int 2004;25(6):438–9. Dayton P, Ferguson J, Hatch D, Santrock R, Scanlan S, Smith B. Comparison of the mechanical characteristics of a universal small biplane plating technique without compression screw and single anatomic plate with compression screw. J Foot Ankle Surg. 2016 May-Jun;55(3):567-71. Vance DD, Vosseller JT. Double Plating of Distal Fibula Fractures. Foot Ankle Spec. 2017 Feb 1:1938640017692416. Singh SK, Wilson MG. A Double Plate Technique for the Management of Difficult Fibula Fractures. Techniques in Foot & Ankle Surgery. 2005:4(4); 235-239. Savage TJ, Stone PA, McGarry JJ. Internal fixation of distal fibula fractures: a case presentation demonstrating a unique technique for a severely comminuted fibula. J Foot Ankle Surg. 1995 Nov-Dec;34(6):587-92; discussion 596. Lowe JA, Tejwani N, Yoo BJ, Wolinsky PR. Surgical techniques for complex proximal tibial fractures. J Bone Joint Surg Am. 2011 Aug 17;93(16):1548-59. Wykes PR, Eccles K, Thennavan B, Barrie JL. Improvement in the treatment of stable ankle fractures: an audit based approach. Injury. 2004 Aug;35(8):799-804. Helfet DL1, Hotchkiss RN. Internal fixation of the distal humerus: a biomechanical comparison of methods. J Orthop Trauma. 1990;4(3):260-4. Shin SJ, Sohn HS, Do NH. A clinical comparison of two different double plating methods for intraarticular distal humerus fractures. J Shoulder Elbow Surg. 2010 Jan;19(1):2-9. Nauth A, McKee MD, Ristevski B, Hall J, Schemitsch EH. Distal humeral fractures in adults. J Bone Joint Surg Am. 2011 Apr 6;93(7):686-700. Kaipel M, Majewski M, Regazzoni P. Double-plate fixation in lateral clavicle fractures-a new strategy. J Trauma. 2010 Oct;69(4):896-900. Prasarn ML, Meyers KN, Wilkin G, Wellman DS, Chan DB, Ahn J, Lorich DG, Helfet DL. Dual mini-fragment plating for midshaft clavicle fractures: a clinical and biomechanical investigation. Arch Orthop Trauma Surg. 2015 Dec;135(12):1655-62. Hirvensalo E, Lindahl J, Kiljunen V. Modified and new approaches for pelvic and acetabular surgery. Injury. 2007 Apr;38(4):431-41.